Have you ever held a world ranking? Or know someone who has? Perhaps you know a tennis player, a golfer or a swimmer? They may not be a household name but were good enough to be ranked in the top echelons in the world at their chosen sport. In 2007, Ian (Cave Hill Creek founder and Tim’s dad) was the 283rd ranked hot air balloon pilot in the world, and the 9th ranked Aussie! The ranking has often provoked a healthy mixture of jest and pride at family gatherings. But ballooning as a hobby for many years has been an important part of the Chandler family identity. And of course, that went hand in hand with Cave Hill Creek where it continues today. 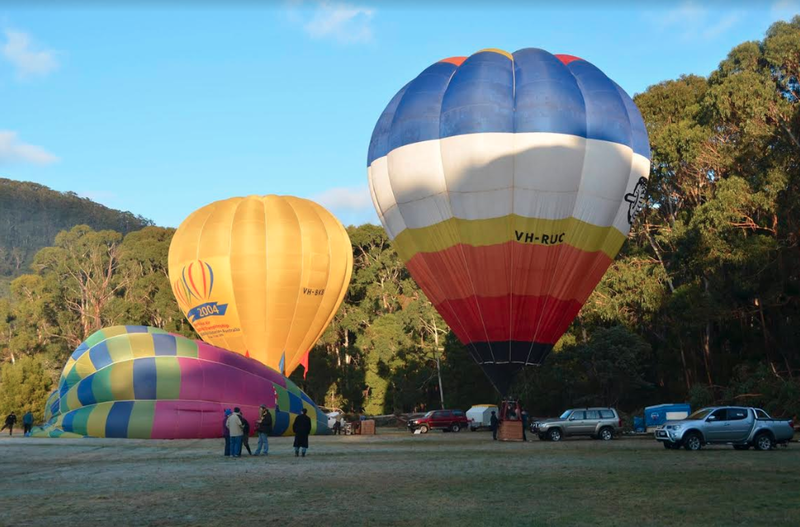 On 10-12 August we are again hosting Hot Air Balloons at Cave Hill Creek. In fact, it is the 26th consecutive annual ballooning weekend. We suspect, at 26 years, it may even be Australia’s longest consecutively run balloon meet! A spectacular sight from both the ground and the air, the balloons bring joy to the faces of young and old alike. Members of BAV (the Balloon Assoc of Victoria) love gathering here for a weekend of fun, frivolity and flying. 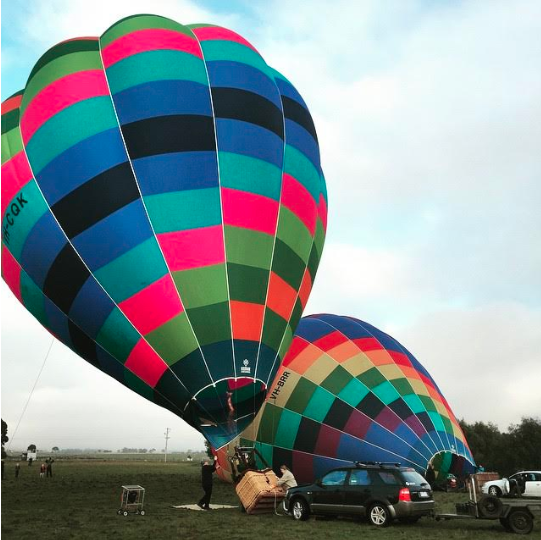 Their colourful balloons take to the skies, often inflating at Cave Hill Creek and flying down the Raglan valley and beyond, weather permitting. Weather not permitting it is also Australia’s best social balloon meet with inflated stories full of hot air blustering about the place over a big breakfast cook up! Other memorable flights include floating on the surface of the lake, and taking off and landing in the same paddock in Raglan after a big loop. From the sky, it is also fun to drift over the Mount Cole State Forest and chasing kangaroos and waving to unsuspecting campers rising from their slumber. Although the meet is for private balloonists, the general public is very welcome to spectate from local roads. The balloons typically take off shortly after dawn to take advantage of cooler temperatures and more stable atmospheric conditions. Occasionally pilots sneak in a late afternoon flight before dusk too. If there’s one take away from one of our countless flights from Cave Hill Creek, it’s that if you’ve haven’t been in a hot air balloon somewhere over our country’s beautiful landscape, you absolutely must. Nothing can compare to the stillness of the morning, with the gentle wind and once you’re off the ground and when the burner isn’t roaring, the silence is surreal. If you would like to join in and follow the balloons, we will post regular flight and weather updates via our Social media channels throughout the weekend. Bring your camera and share your shots with us at #cavehillcreek. And if you too catch the ballooning bug join us following the exploits of 4 talented and dedicated Aussies attempting their rise up the world rankings at the World Hot Air Balloon Championships in Poland later this month. For next week’s instalment of our ’30 stories for 30 years’ series, we take a look at some of the beautiful art bestowed on us from some of our very talented guests over the years.